Darkness rises… and microtransactions rise to meet it. I think that’s how the new Star Wars saying goes. So here we are to discuss Star Wars Battlefront II, a game packing a brand new single player story, a revamped multiplayer, and a whole lot of other concerns. With this new Battlefront, I actually have something to say! The single player story puts you in the Imperial boots of Iden Versio, commander of a special forces unit known as Inferno Squad. The group was introduced earlier this year in the book Star Wars Battlefront II: Inferno Squad by Christie Golden, so for those who read it, you know the gist. The unit was established to avoid Imperial setbacks after the destruction of Death Star 1. So naturally, the destruction of Death Star 2 happens. Inferno Squad is set to avenge the fallen Emperor by carrying out Operation Cinder. Even to a special forces group like Inferno Squad, the Imperial operation is shrouded in mystery and kept on a very need-to-know basis. The story sees the team’s reaction to carrying out such an operation and connects several dots between the Battle of Endor and The Force Awakens. Through it, you get to see film events from new angles and novel/comic events that were only minimally seen. Fan favorite characters also make several appearances along the way, and you get to play as some of them. Otherwise, you’re looking at a reworked multiplayer that has gone through enough controversy that it’s arguably more interesting than anything the single player campaign could possibly tell. 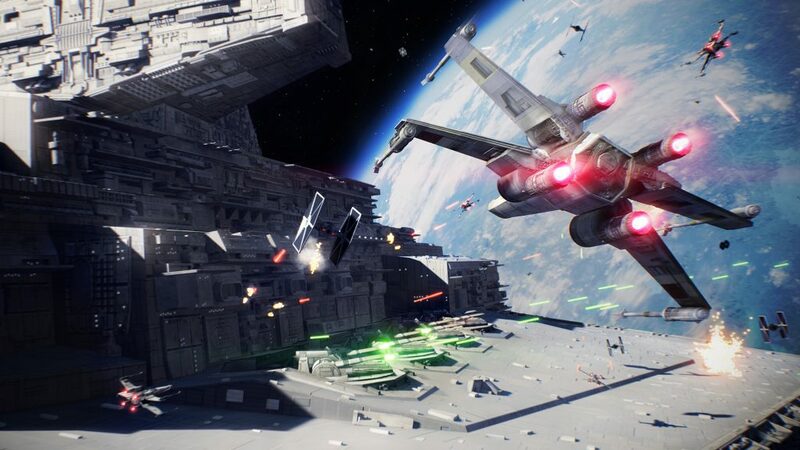 Battlefront II offers a significantly slimmed down set of game modes, offering Galactic Assault, Starfighter Assault, Heroes vs. Villains, Strike, and Blast. But while game modes were slimmed down, character selection was beefed up through a standard class system of troopers. New weapons, abilities, and cosmetic elements are primarily earned through performance or in-game currency, though many abilities and Star Cards (power-ups) are contained within much maligned crates, better known as loot boxes. Coming into the game, crates were designed to be a mystery box of items purchased by credits or crystals. Credits are earned through single player accomplishments or general multiplayer performance, but crystals are primarily “earned” with real-life currency. This pay-to-win method generated an incredible amount of negative feedback and, by the time our review time with the game took place, the ability to purchase crystals was removed from the game. Finally, a second major concern with the game was addressed prior to this review. 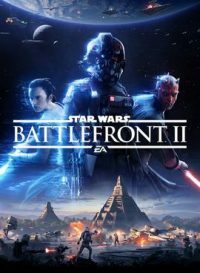 Heroes for multiplayer use, such as Luke Skywalker and Iden Versio, are purchasable through credits. It was discovered that the cost of any one hero could take days upon days of continuous play, leading to many heroes being so far out of the range of purchase opportunity. Hero costs were significantly reduced prior to this review. Obviously, with what I outlined above, the situations didn’t have much of an impact with my direct experiences with Battlefront II, but the changes that were made still leave plenty of room to fall back into negative areas. They’re still kind of there. Crates can include anything from credits, crafting parts, or a range of Star Cards, but what you get is ultimately a crap shoot. Your daily crate, a free one gained from simply logging in, will include some small amount of credits or parts. Credit-paid crates will include some common or rare Star Card, which can definitely impact your gameplay. So while you can’t pay real money to get more and more crates, you must still complete a lot of gameplay to purchase crates. Star Cards can still be purchased through crafting, but craft parts tend to come at a much slower rate than credits. Should those who dedicate more time and effort to the game be rewarded with more? Sure, there’s nothing really against that. A solid example is gating weapons behind the performance, where I can only get the next heavy weapon if I complete 50 kills. I know what I’m in for. But how much are you being rewarded if you’re simply earning something random every time? What if you’re purchasing crate after crate, only to find yourself with a lot more emotes rather than Star Cards? Well, you’re going to feel hosed. The game will need to do something more than temporarily take away the ability to buy crystals if it wants to create a much better balance of a performance vs. reward ecosystem. That’s not to say the game is doing everything wrong–it can actually be quite fun in a lot of areas. I found nearly all the game modes to be much more engaging and smooth than those found in the first reboot of Battlefront. Starfighter Assault in particular. The flight gameplay in both multiplayer and single player was fantastic, despite some overly clunky UI design. Ships were a delight to pilot. Galactic Assault, the 40 player game mode, was enjoyable whether on an open map like Naboo or a much more confined space like the Death Star 2. The overall lack of game modes didn’t hamper the experience; it simply made it much tighter. There was enough diversity between the modes, too, where I could get different enjoyment out of each, outside of the blatantly obvious (flying and 40 person modes). Heroes vs. Villains, for example, was a great way to surely play as a hero character, though you definitely need to spend credits to expand your selection of heroes. 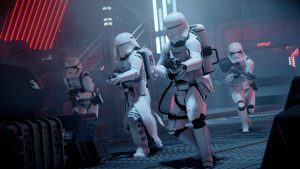 Strike offered the ability to play as other heavy characters, such as Death Troopers, that weren’t available in other modes (though there are general equivalents). Arcade Mode replaces the previous attempt at single player offerings and is much more dictated than before; it was fine. But what of single player? This was my biggest excitement going into the game since the last Battlefront didn’t entirely feel like true Star Wars to me. This time? I was pleasantly surprised with what we got. Inferno Squad’s story is certainly a worthy one. 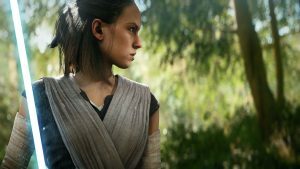 You get to play as a strong character with an interesting story from an Imperial point of view that isn’t often seen in the very hero-driven saga. It didn’t take the wrong type of advantage of well known Star Wars lore very often; it brought to life planets rarely, if ever, seen. It offered some great ground battles as well as enjoyable flight experiences. It’s a solid story, but one that goes a little too fast and doesn’t always hits the notes it should have. For the path Battlefront II has taken, that is an incredibly appropriate question. I say yes. The game doesn’t feel like an incomplete mess that I have to continually pay more and more money towards. Do I need to keep paying in-game currency towards a randomized reward system? To that, I also say yes. So that’s where the balance needs to be fixed, but it doesn’t take the enjoyment out of the game. 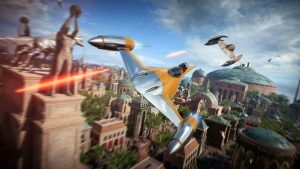 Despite its flaws, the single player element helps usher in a much more enjoyable Battlefront package that is more worth it than not. The single player campaign is a genuine Star Wars story that fits well into canon. The multiplayer includes a lot more planets, newer types of characters to play as, and some enjoyable modes that improve upon the previous game. But what this game needs to do to survive is fix its microtransaction problem through and through, and that’s not something a bacta tank can take care of. A copy of the game was purchased by the reviewer. The campaign was played to completion. Several hours of multiplayer were dedicated to each game mode and trooper class. INteresting! Great Review you’ve given me a lot to consider since I really want to play the star fighter battles but I hate loot boxes.